Bodegas Enrique Mendoza is the main reason why the Alicante DO has become so well known. A winery that produces wines with a distinctive Mediterranean character. Towards the end of the 1970s, Enrique Mendoza undertook the project of crafting wine, at first only for family consumption, in Marina Baixa, a region in southern Spain. Later, Mr. Mendoza's passion for wine lead him to found Bodegas Enrique Mendoza in 1989. Today the winery is under the control of his children, José and Julián. 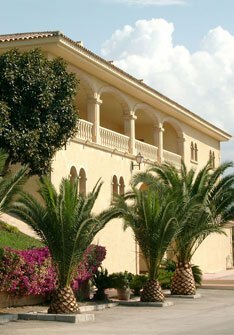 The Bodegas Enrique Mendoza winery is situated in Alfàs del Pi, in the province of Alicante. Its vineyards grow in plots located at an altitude between 365 and 640 metres above sea level, near the town of Villena. Comitted to environmentally friendly practices, the winery strictly follows the principles of organic farming and avoids the use of chemical herbicides and pesticides. Hydric stress is routinely monitored to ensure that the grapevines receive the correct amount of water, thus reaching a proper size and an optimal concentration of sugars. The Bodegas Enrique Mendoza winery cultivates Chardonnay and Moscatel (Muscat) grapes for their white wines, and Cabernet Sauvignon, Merlot, Pinot Noir, Petit Verdot, Syrah, and Monastrell (Mourvèdre) grapes for their red wines. The wines are fermented in stainless steel vats and then aged in French oak barrels from Allier, American oak barrels from Missouri, and American oak barrels from Oregon. Red wine from Alicante. Cabernet Sauvignon, Merlot and Syrah aged for 17 months in new French oak barrels. Single varietal Petit Verdot from Alicante, aged for 14 months in American and French oak barrels. Young white wine from Alicante made from Chardonnay aged for 5 months on lees. Sweet white wine made from Muscat of Alexandria in Alicante. Crianza red wine from Alicante made from Monastrell and aged for 14 months in used French oak barrels.